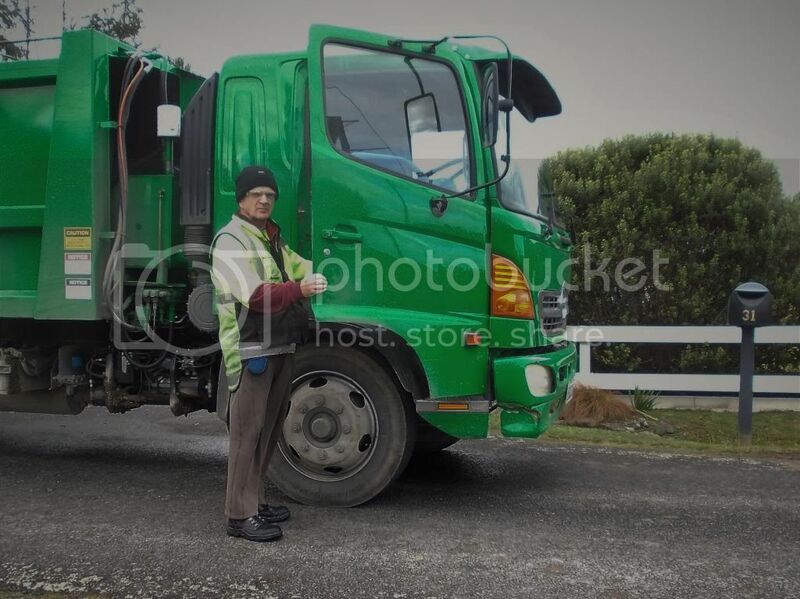 Last Tuesday was the last day of my "One- day- a- week" job on the wheely bin truck. The company is changing the way they do things and eliminating any down time. This meant that one of the full-time workers could be made available to do my job, so I'm no longer required. 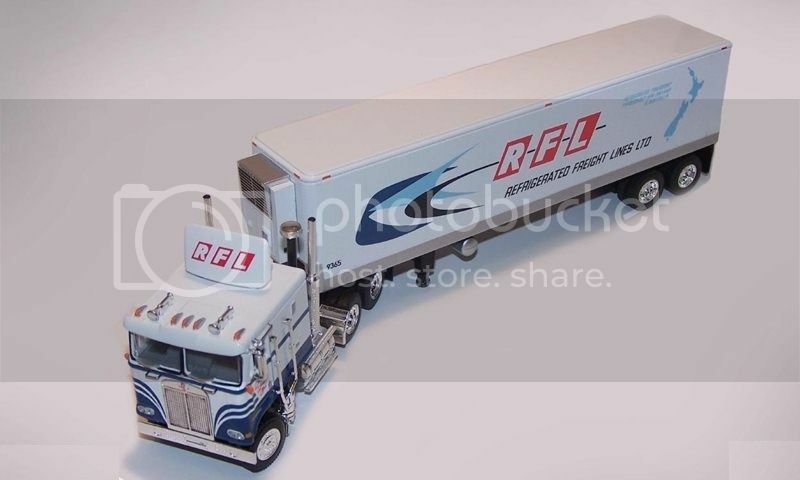 You might not think of rubbish collection as much of a job, but I actually enjoyed the one day a week of driving a truck and cruising the country-side, as much of my run was servicing life-style blocks in rural areas. That's me with the trusty Hino on the last day. Self-taken with the camera's timer, so there was no-one to tell me to smile! And no, I'm not into full-time spectacle wearing just yet, they are safety glasses as they compactor can fire bits of glass at you when customers choose to put their bottles in their bins. For the last couple of months I have been looking to replace the Caldina, which has clocked up over 270,000kms. Although I'm sure it has many thousands of kms left in it yet, I thought now would be a good time before its value dwindles away to nothing. I looked at buying a freshly imported later model Caldina, but I was unimpressed with the overly intrusive lumbar support (which isn't adjustable) and the firm ride on the 17" wheels on the example I looked at. Last week this Fielder turned up at work as a trade- in and was too good to turn down. It has been well looked after by one NZ owner who even kept a log book of every tyre, wiper blade and spark plug that has ever had. 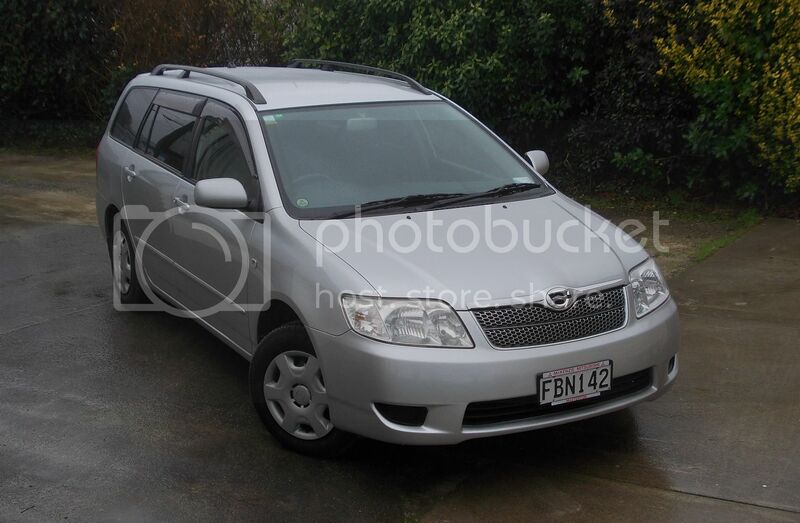 It's not quite as refined as the Caldina ( slightly more road noise and not quite as good a ride) but certainly more power with its variable valve timing and a towbar already fitted along with an NZ radio and weather shields over all 4 side windows, which the boss (wife) said was essential. The Caldina has been a very good car, which we bought as a fresh import in 2007 with 120,000 on the clock. Although the lean-burn 1800 could be considered "gutless" if left to its own devices in "drive", leaving it in the power mode all the time and using the auto selector manually on hills has seen it leave behind much more powerful cars on several occasions, reliability has also been magnificent with only normally expected wear-and-tear items replaced. I'm sure I'll get used to the Fielder , though I still find the driving position odd (you need short legs and long arms), but I hate those wheel trims and am looking for a set of "mags". Activity on this blog has been slow lately. The reason being that I have finally updated my computer, which was going slower by the day, but now I have to get my head around the unfamiliar systems of Windows 8.1. Here's a couple of recent shots to keep you going. 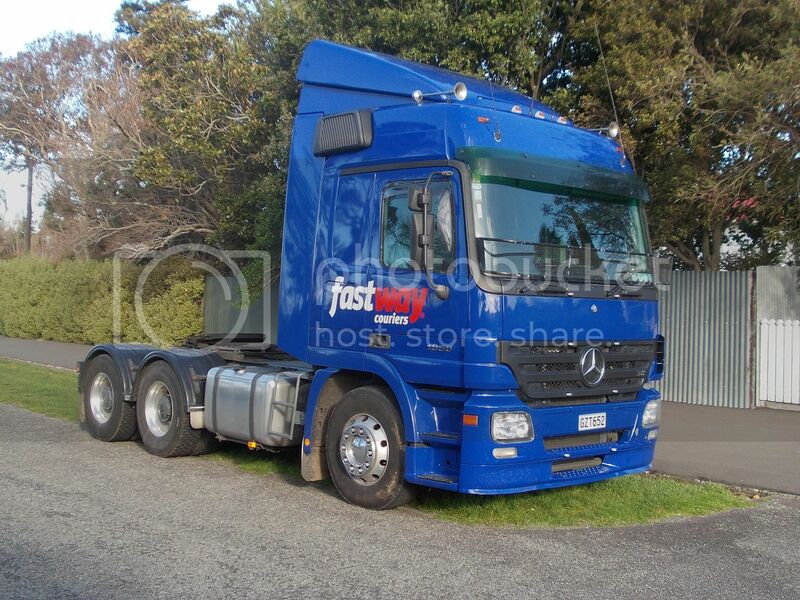 Low cabbed Mercedes- Benz Actros is parked regularly in a Featherston urban street. 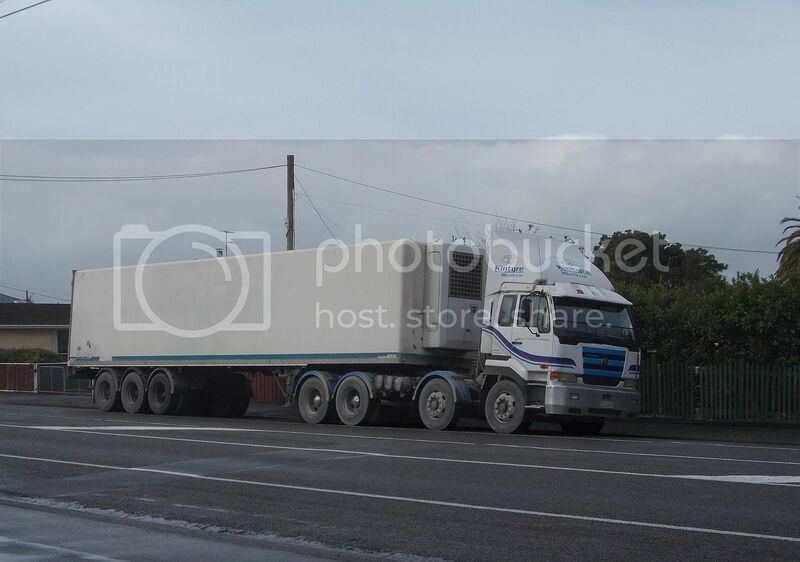 Kintyre Meats' UD CG450 8 wheeler pulls a 3 axle reefer.